Uh, yep. In fact, I have more than tips, I’ve basically distilled my travel regime down to a science. I know exactly what I’m taking, where it goes in my suitcase, and the fastest route to the airport lounge for one last glass of wine to fill up my water bottle and to check my email like the responsible person I am. Because I’m asked so often what it takes to travel so much, I thought it would be fun to compile a list of my must-have travel products. There’s more to the process of professional business travel than a quick shopping trip can do, but these 10 essentials will get you moving in the right direction! The Sherpani Soleil bag. My friends and colleagues have joked that I should become a spokesperson for Sherpani, such is my intense love for this bag (uh, Sherpani? I’m open.) It’s a sturdy tote that’s professional enough to carry to client meetings, yet will sling over your shoulder or torso messenger style, and ALSO becomes a backpack when you suddenly have your hands full, a sore shoulder, or find yourself doing a little surprise hiking (what, it happens!) It also has a luggage strap, so it will slide onto the handle of a roller board suitcase like buttah. BUTTAH. Laptop sleeve, water bottle pockets, and just the right amount of space make this bag the best $100 I’ve ever spent on travel accessories. BUY ONE RIGHT NOW WHY ARE YOU STILL READING THIS. Bose noise canceling headphones. You know that roaring in your ears when you get off the plane? That ain’t happening if you wear these headphones. They cut out the ambient noise just enough so that you can still hear the world around you, but it’s just low enough that you can block it out. Crying babies and overly chatty flight attendants on Southwest, I’m looking at you. It also sends a subtle message to your seat neighbor to pretty please ZIP IT. Vaseline. This is really a life essential more than a travel essential, but I won’t get on a plane without it, so it makes the list! Vaseline replaces about 10 other things in a cosmetic bag, from eye makeup remover to lip balm, hand cream to soothing a cut or scrape. The travel size pot is about two bucks at Target and they are in every suitcase and tote I own, just in cases. Burt’s Bees grapefruit face wipes. These are a life saver, especially for international flights or long layovers. The grapefruit smell is lovely and can make even the most tired traveler feel a little more pulled together upon arrival. Oversize scarf. I usually reach for my pale blue pashmina from Paris, or this giant tartan, but any big scarf will do. I use them as blankets on the plane, to bundle up in case it’s cold, and to jazz up the basic blacks and grays that make up 90% of my wardrobe. iPhone and extra charger. While I dream of the day we all get tired of screens and go back to typewriters and letters, it’s not happening. I have a little folder on my phone just for travel apps. My favorites are WhatsApp for free global texting, CityMapper for navigation, the United app for checking in and mobile boarding passes, the AirBnb app to keep in touch with hosts, and Skype Qik to send fun videos to friends and family! Glass water bottle. Fo much flying is bad enough for Mother Earth without buying plastic water bottles and effectively punching good old M.E. in the face. I try to combat this in a small way by filling up my glass water bottle pre-flight and saying no to all those little plastic drink cups from flight attendants. Eye mask. A must for international flights, but sometimes I want to get a head start on sleep coming back from the East Coast, when I might land at midnight or 1 am. Eye masks help you sleep like a champ and help you channel your inner Holly Golightly, too. Airport-approved footwear. With admission into TSA Pre, I no longer have to take my shoes off and it’s like traveling in 1992 (thank you, Baby Jesus) but in those rare instances Pre is closed and you end up like Shoeless Joe, you don’t want to be that schmo holding up the line trying to unlace your gladiator sandals. These fly slip on sneaks are my current fave. And here I thought Aerosoles were just for grandmas! What are your travel must-haves?! I’d seriously love to hear! We are back from Italy and Greece and have begun the slooow recovery process of acclimating back into life as SF residents, rather than residents of Pyrgos, the charming Greek village we’ve been living in for the past week. Um, I mean visiting. We certainly didn’t pretend that we were Greeks who lived in a luxe wine villa with a hot tub, but who also had no noticeable way of making income other than going to the beach every day, nosiree nope not us. Travel is so restorative, and being in Greece was especially amazing. It was my first time there and Santorini is for inspiration and dreams, I tell you. It was the most magic place I’d ever been, and among the most magical of things: FOOOOOOD. As everyone knows, we at this house love to cook and eat. And yet, one of the perks of vacation is that you can pay someone else to do half of that equation for you for a few weeks and not feel even a little bit badly about it. Just because we’re back does not mean I plan on quitting my regime of Greek salad any time soon. I just had to San Francisicify it a bit, give it a little more protein and warmth for the chillier weather we’re having here. This may make the Lebanese shudder at the sacrilege of it all (sorry, Joya!) but it’s so delicious, let’s just hope they’ll make it and forgive us. 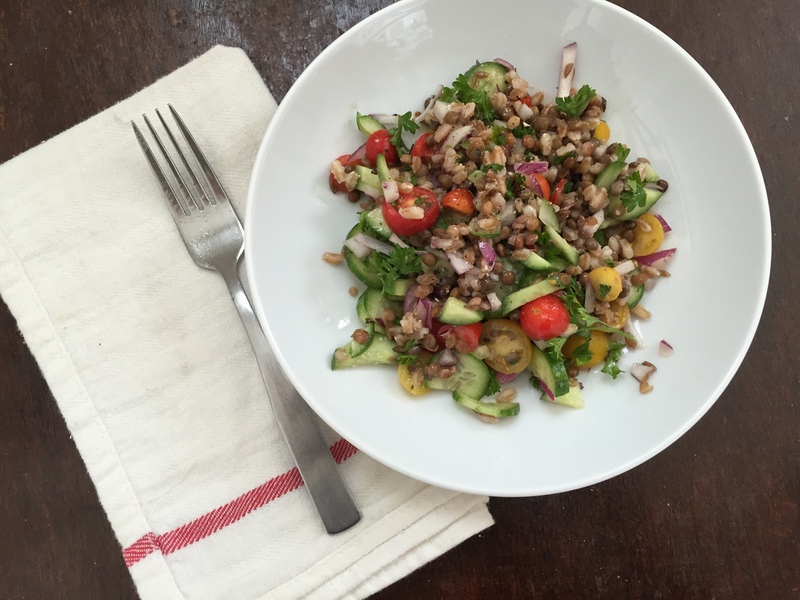 This tabbouleh calls for faro instead of bulgar, for extra heartiness, and cooked lentils for protein and to complement the nuttier flavor of the faro. 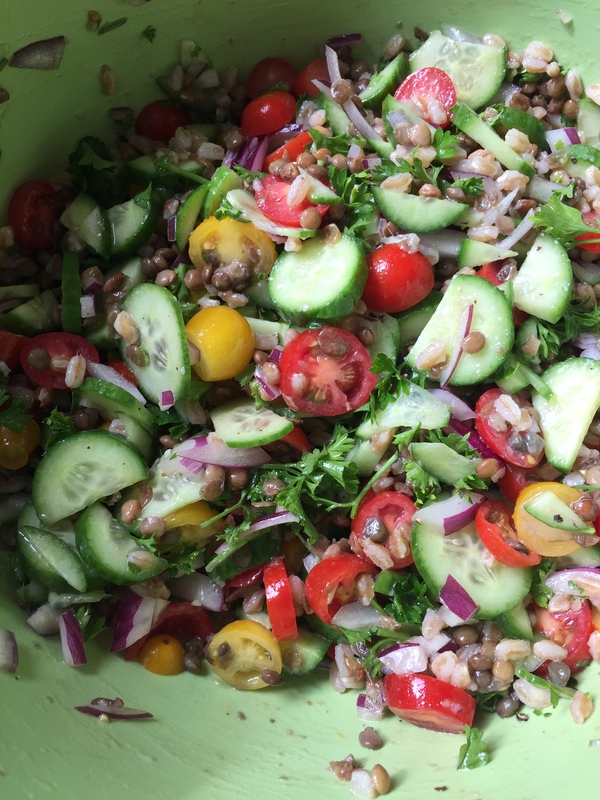 The result is a hefty little salad that will fill you up without weighing you down, while also whisking you back to the best of Greece. Cook the faro according to instructions. Chop the tomatoes, parsley, onion, cucumbers. Put it all into a big bowl, add the lentils, and mix mix. Once the faro is cooked, add it into the big bowl and top with the juice of two lemons and a very generous glug or two of EVOO, salt and pepper. *Please note – you can play with all these measurements! 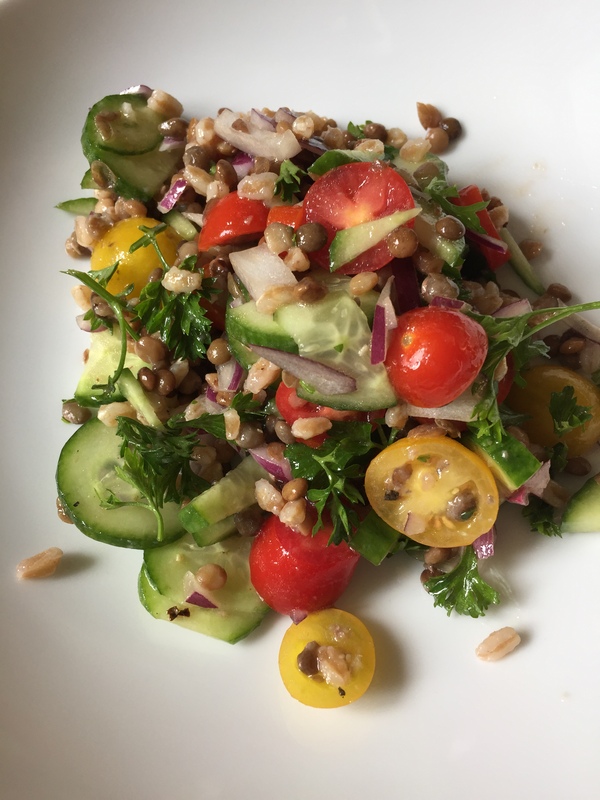 This is how I happen to like my tabbouleh, but if you want more lemon or fewer tomatoes, or whatever – go for it!